The meeting collapsed after Mr Trump refused to lift sanctions unless North Korea destroyed all its nuclear sites. “We have no intention to yield to the US demands in any form, nor are we willing to engage in negotiations of this kind,” Ms Choe said according to Russia’s TASS news agency. 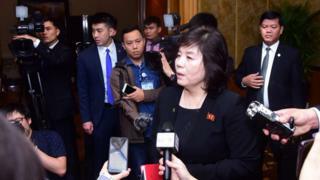 Mr Kim is set to make an official announcement soon on his position regarding future talks with the US, Ms Choe said. Mr Trump has met Mr Kim twice in unprecedented summits between a US sitting president and a North Korean leader – the first was in Singapore last year, and the second was in Hanoi in February. Speaking at a news conference after the Hanoi summit, Mr Trump said no plans had been made for a third summit, but he expressed optimism about a “good outcome” in the future.